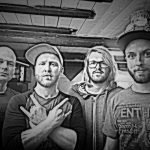 KJURIOUS from Herning was formed back in August 2008, and there’s no doubt, that they have a lot to offer. The band consists of four members, ageing from 26 to 31 years. KJURIOUS play a fusion of modern rock, indiepop and progressive tendencies, and this mixture makes the ever “music-curious” KJURIOUS to something really special and unique. When the boys are live they are one big stomach punching, all provoking unforgettable experience, one you just cannot miss. The band released their debut-EP in the winther of 2011, entitled “Spoken Words”. Furthermore KJURIOUS also have several music videos, which can be seen, on for example Youtube and BlankTV. These Herning-boys have a very enormous potential which they proved by winning the finals in “Trekantens Musikpris 2010” and “Jam Contest 2010”. In 2012 the band won “Skive Band Battle”, the prize for which included a big sum of money, and a live gig at Skive Festival 2012. The band supported both Inside the Whale in Herning in 2013, and the famous Danish hard rock band Pretty Maids at Fermaten in Herning the same year. Then KJURIOUS went on a tour in 2014 with the punk rock band The Senton Bombs, with gigs in Denmark and England. They also supported Go Go Berlin and Runrig at Brande Open Air, and later in 2014 they went on a tour with The Senton Bombs again.